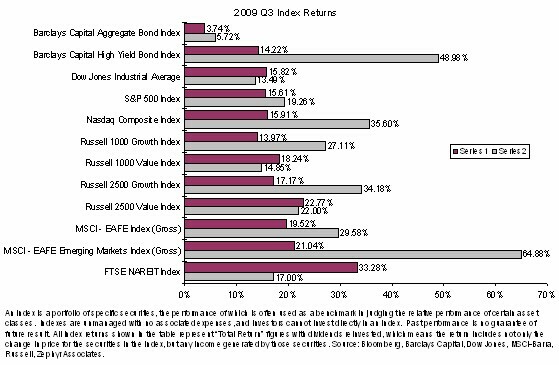 The market rally that began in mid-March, driving double digit equity returns in the second quarter, continued throughout the third quarter of 2009. Despite some volatility at the close of the three-month period ending September 30, 2009, the S&P 500 Index gained another 15.61%. 1International returns were just as strong, with currency gains giving U.S. investors an additional boost. The MSCI EAFE international index saw a 19.52% return and emerging markets tallied 21.04% according to the MSCI Emerging Markets index for the period. How strong has the rally been? From the March 9 low through the end of the third quarter, the S&P 500 Index returned a remarkable 58.25%. It is tempting to breathe a sigh of relief and assume that we have emerged from the worst financial crisis in decades and can now get on with our investing lives. However, a little perspective may restore some caution. The one-year return for the S&P 500 (through September 30, 2009) was down – 6.91 %, and we closed the quarter approximately – 29 % off the October 2007 highs. While the rally has provided welcome relief, the damage done by the financial crisis was significant and will require careful navigating for some time to come. In fact, the rally raised new issues that have divided analysts’ opinions, including whether or not the extent of the rally was justified, whether it can be sustained and, finally, whether prices will slide again. We believe there are reasons to be cautious, as well as reasons for guarded optimism. The resilience of the rally may be tested in the fourth quarter. Even if the rally continues, we are unlikely to experience a third consecutive quarter with double-digit returns. Many believe the immediate fate of the market may be determined by three interrelated areas, including the credit markets, economic activity and stock valuations. Let’s take a look at each. Credit: Much of the Federal government’s activity since the financial crisis erupted has been focused on stabilizing the credit system. (Credit is enormously important to the U.S. economy, fueling both business expansion and consumer spending.) But despite a historically low Federal Funds rate2 and massive injections of cash into the system, we have not seen a significant increase in lending. There are a number of reasons why that may be the case. It may be that banks, still repairing the damage done by the financial crisis, have focused on shoring up their capital positions rather than making new loans. Investors responded favorably to this conservative approach, driving the S&P 500 Financial Sector up 25.53% for the third quarter. Nonetheless, an increase in liquidity induced-business and consumer activity over the coming months may help further the current rally. Economic Activity: Perhaps the economic indicator that grabs the largest share of headlines is unemployment. That’s understandable considering how devastating job loss can be. But it is important to understand that the unemployment rate is generally considered a lagging indicator – in other words we expect to see positive economic movement before we see positive movement in employment numbers. Other positive indicators include new and existing home sales, which have strengthened overall in the third quarter. Additionally government stimulus spending on infrastructure has largely worked its way through the political and bidding processes and may begin to lift activity. Over all, the consensus seems to be growing that we have either already moved out of or are currently moving out of the recession. Valuations: When an investor buys or sells a stock, he or she is essentially offering an opinion on whether or not future business activity will justify its current (and projected future) price. Certainly, investors have been showing a great deal of faith in the business and economic future during the rally. Will they be proven correct? There are a number of ways to consider whether stock valuations are justified, but one measure that may be relevant in the current environment is Price-to-Sales ratios (P/S). According to Ned Davis Research, Inc.4, P/S ratios typically expand at the beginning of a post-recessionary economy as investors appear to be willing to wait for sales (and earnings) to rise. The 2001 – 2003 recession offers a cautionary reminder, as P/S ratios expanded until weak economic growth and declining sales eventually slowed market gains and, in some sectors, undermined prices. Ned Davis believes that significant sales growth will be required to support the current rally. While consumer discretionary spending may be unlikely to return to pre-bear market levels, we may see sustained sales growth on a year-to-year basis. Similarly, expansion in China may help materials and energy-related sales, while a return of more normal lending practices may help industrials. The narrowing of Price-to-Sales ratios through increased sales over the next months would be a very positive sign for the economy and the market rally. We are emerging from an especially challenging period, but while much of the sting has been taken out of the bear market over the last six months, potential opportunity and causes for anxiety will almost certainly emerge over the fourth quarter. This uncertainty reinforces our view that a diversity of approaches to asset allocation, portfolio strategists, and asset classes may help you balance risks and rewards, and capture returns with reduced volatility. As always, we thank you for the trust you have placed in us. We look forward to discussing your evolving financial goals, as well as reviewing the mixture asset allocation approaches within your portfolio, as we seek to keep your investment plan aligned with your needs. 1 All returns sourced from Bloomberg Finance L.P.
4 Investment Strategy, September 2009, Ned Davis Research, Inc.
MSCI EAFE Emerging Markets Index posted an increase of 21.04% during the quarter and a 64.88% year-to-date. The FTSE NAREIT Index returned 33.28% during the quarter and 17.00% year-to-date. In the bond markets the Barclays Capital Aggregate Bond Index returned 3.74% during the quarter and 5.72% year-to-date. The U.S. Economy contracted 0.7% during the second quarter improving relative to a 6.4% contraction experienced during the first quarter of 2009. The Federal Reserve (“the Fed”) decided to keep the Fed Funds target rate within the 0.00% – 0.25% range. Measured by the Consumer Price Index, inflation for the month of August was -1.5% on a year-over-year basis iv. Unemployment, as measured by the jobless rate released by the Bureau of Labor Statistics in September was 9.8%. Oil futures closed at $70.61 per barrel in September, a price increase of 1.03% from its close from the second quarter of 2009 v. The U.S. Dollar depreciated against the Euro by 3.71% for the quarter; and depreciated 6.91% versus the Japanese Yen for the same period. The opinions and forecasts expressed are those of Genworth Financial Wealth Management, and may not actually come to pass. This information is subject to change at any time, based on market and other conditions and should not be construed as a recommendation of any specific security or investment plan. The representative does not guarantee the accuracy and completeness, nor assume liability for loss that may result from the reliance by any person upon such information or opinions. Past performance does not guarantee future results. The S&P 500 Stock index is a widely recognized, unmanaged index of common stocks. Average annual returns assume the reinvestment of all distributions and/or dividends. Indices are unmanaged, statistical composites and their returns do not include payment of any sales charges or fees an investor would pay to purchase the securities they represent. Such costs would lower performance. It is not possible to invest directly in an index.